"Polenta is seen as a side dish in this country, but in Italy it’s often given a starring role. 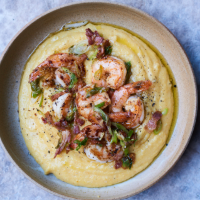 Real polenta needs a low slow cook – look at it like cornmeal porridge. It takes about an hour and involves a fair bit of work, especially as you come to the end of the cooking process. There are lots of myths about polenta, but in my experience, there’s not much that can’t be fixed by a really good beating with a whisk. 1. Put the chicken stock, polenta, thyme and ¼ teaspoon of salt in a medium saucepan and bring to the boil. Allow to simmer over a very low heat for 1 hour. Initially it will resemble murky yellow water, but have patience, it will slowly come together. Keep whisking the mixture, especially during the last 15 minutes of cooking, to prevent the bottom of the polenta scorching. 2. Once you have a nice thick gloopy consistency similar to a well-cooked porridge which pulls away from the sides of the pan and has no bite to it when tasted, mix in the cheeses, butter and peppers. You will notice that the polenta lightens in colour and becomes lovely and shiny. Season with salt to taste and keep hot until ready to serve.